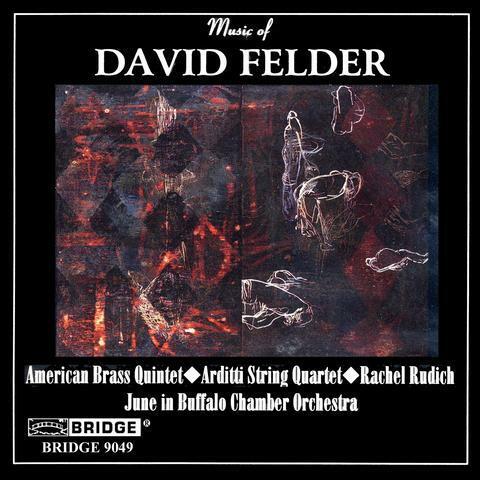 David Felder (1953) is currently one of the leading independent and most uncompromising American composers of his generation. Presently Professor and Coordinator of Composition at the State University of New York at Buffalo, he is also responsible for the Artistic direction of June in Buffalo, a festival for emerging composers for many years. From 1992 until 1996 he has closely worked with the Buffalo Philharmonic Orchestra as the composer in residence. In his own words, his evolution as a composerhas been influenced by Roger Reynolds, Donald Erb, Bernard Rands,Robert Erickson and David Cope. Nevertheless, these influencesmust be understood exclusively in relation to the purely technicalprocess including incorporation of NeXT-Computers. There is inthe case of David Felder and his personal and particular powerfullanguage, then, rather the influence of probably the whole band-widthof European music, however under the light of a new century. It would be possible to extract a philosophy from the unbroken thread appearing through the chamber music-like five pieces represented as an example: the dazzling antagonism between dangerous and graceful activity, and static, distanced tranquility; the complexity and virtuosity in the handling of the ensemble and instrument; finally, the varied harmonic "colorfulness". Immediate access to this music that does not compromise or subordinate to a "saleable" idiom is undeniable; as well, its unique strength/power and vitality creates a sound-aesthetic full of sensual eruptions. This is especially true for the two pieces for chamber orchestra Three Lines from Twenty Poems (1987) and Journal (1990). In these pieces, David Felder proves himself not only as a composer that knows how to concentrate and use the subtle nuances of the instruments, but also as a composer that can use at the same time an extreme sense for the right balance between different tension-fields. November Sky (1992), for flute, incorporates the addition of a NeXT Computer to bring to reality a multi-layered, enhanced, sound-variability; (it is) an "in and out swelling" Lied of more than 16 minutes of duration in contrast exchange of Joyfulness and melancholy. The movement for string quartet, Third Face(1988-98), startles through its unpretentious aggressiveness and drama, in which the few quiet passages contribute to the intensification of the climax rather than the relaxation. With Canzone XXXI (1993), Felder devotes himself to the refreshingly direct manner of the Brass Music of the 16th century Venetian tradition. these few examples show a directness free from any coercion, individualistic, and dictated exclusively by the suggestive power of the music. A voice whose weight is accentuated by this technically balanced and interpretatively captivating CD.